Nicolas Cage and Alfred Molina spell it out. A nerdy young guy learns to cast spells and thus saves the world from a newly reconstituted evil wizard. But his name is not Harry Potter -- it's Dave! And they say there are no new ideas. Disney's The Sorcerer's Apprentice has a storyline similar to the popular J.K. Rowling series, but in fairness, a youngster on an occasionally magical journey of self-discovery is something of an evergreen. Frankly, Apprentice can't come near the Harry Potter films -- and not just because it stars Nicolas Cage -- but at least it knows it. The film eschews any compelling character arcs; buys a nickel's worth of backstory; and blows the rest of the budget on flash-and-crash, New York City location shooting and lots of hair product. It's self-consciously junky, but its entertainment value is pretty hit-or-miss. We begin in "Britain 740 AD," in a choppy, confusing preamble that introduces us to the era's top magician, Merlin, and his three acolytes. But one junior magic-man, Horvath, turns rogue and becomes the tool of a nasty sorceress named Morgana (Alice Krige). There's some blistering spell-casting in a castle, and when the sparks settle, Merlin is dead; Morgana has been trapped inside a wooden doll; Horvath is missing; and Merlin's best student, Balthazar (Cage), has been tasked with finding the next great magician. If Horvath gets the doll, he can release Morgana, who will then cast "the rising," a powerful spell that converts the dead into an army that will in turn "enslave mankind." As Merlin's heir apparent, only Dave can stop Morgana. So, Dave needs to drop Tesla ("These coils are my life!") and get crackin' on spells! Especially now that Horvath has his own assistant, Drake Stone (Toby Kebbell), who's been using his magical skills for a Cris Angel-type career. 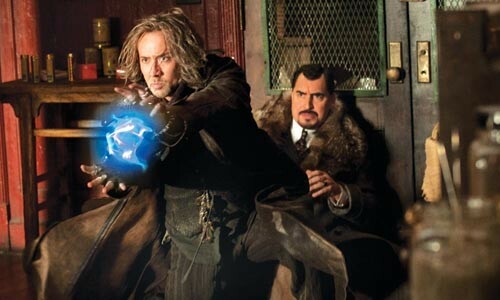 Nicolas Cage, looking like he stumbled out of a very rigorous adaptation of a Dickens novel (among his sartorial flourishes are a pair of knitted sleeves -- just sleeves), is fairly restrained, given that he plays a stressed-out, centuries-old magician. Baruchel, recently seen in She's Out of My League and heard in How to Train Your Dragon, is at risk of being typecast as the squeaky-voiced nerd-turned-hero. Alfred Molina -- perhaps the only British thespian left out of the Harry Potter series -- looks fantastic in his fur-trimmed topcoat, and puts just the right glaze to his malevolent hamming. The Sorcerer's Apprentice is produced by the King of Big, Loud Movies, Jerry Bruckenheimer, and directed by Jon Turteltaub, who previously worked with Cage on equally junky National Treasure films. In lieu of story, Apprentice cranks up the action in a few "blockbuster" scenes: a dragon rampage in Chinatown; a car chase through clogged Manhattan (yawn); an attack by the big metal Wall Street bull (please be a metaphor for 2008! ); and monumental sky-high battle of sparks, forcefields and fireballs at Battery Park that curiously attracts no spectators or cops. Everything is scored with equally clanging, bombastic music, and the CGI crew is working overtime, morphing objects and people and turning the Chrysler building into a flying machine. One has to wonder what Mr. Walt Disney would make of this rote craptacular that so blithely trades on one of his studio's most memorable and beloved animated works. This Sorcerer's Apprentice supplants whimsy with cliché, imaginative visuals with cheesy CGI-generated gags and a gentle morality lesson with a crash-course in victory via mind-controlled fireballs. It's certainly more trick than treat.